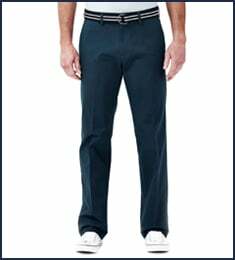 Hidden Expandable Waist: Expands up to 3"
BIG & TALL Cool 18 Pant is rated 4.2 out of 5 by 43. Rated 3 out of 5 by BOBBYBONZ from Cool Yes Fabric construction zipper buttons components excellent Why are pants (vast majority of labels/mfg.) cut so short in the crotch ? For a big/tall I would expect at least 16 "
Rated 5 out of 5 by ProfessorB from Nice Pants The cool 18 lives up to its name as they are very comfortable hot weather pants. 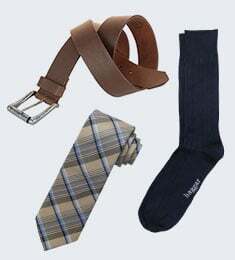 Selection, price, and service from Haggar were all outstanding. Fit and finish is very good. Rated 5 out of 5 by Pasta man from Great product. These are great for a man of my girth. And, they are so easy to care for too. Rated 5 out of 5 by wieds from Very comfortable pants I bought 2 pairs of these after having a few pairs bought a year earlier. One pair fit perfect while the 2nd pair was probably a size bigger in the waist. I know there always can be a difference in how they are made and since I wear a belt with them I can live with it. I gave it a 5 because of how comfortable they are. 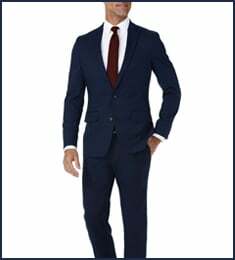 Rated 5 out of 5 by LesS from Great fit and good looking slacks The Haggar Cool-18 slacks always seem to fit great and look great while wearing. I really like the feel of the material that is used in the Cool-18 slacks. Rated 3 out of 5 by skip914 from Wearable BUT... I just received my order of two pair. Excellent shipping time. The length is not real accurate but for me it makes no difference as I have to shorten the length anyway. I will say the “cut” and “fit” are definitely different from the last 3 pair I bought. Slightly lower cut and not nearly as full a cut as one would expect in a “big and tall” pair of pants. Also I prefer the slide and hook plus a button closure over this single button closure. 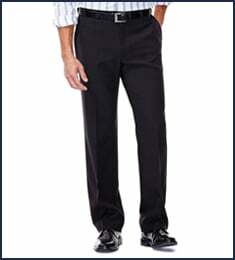 I will say these are wearable, but definitely are NOT near the quality slacks I have received in the past.